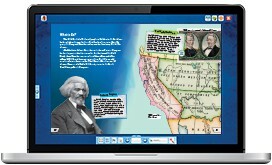 Discover an innovative, integrated approach to social studies instruction featuring high-interest student texts, creative lesson plans, inquiry-based analysis of primary sources, and an emphasis on interactive student engagement. As an added benefit, it’s perfect for your ELA block, with the flexibility to fit into whole-class and small-group instruction as well as a Balanced Literacy approach. Each Student Collection includes everything a student needs for the program, with flexible per-student pricing. social studies through the arts. skills and social studies concepts. Everything teachers need to implement the program in their classroom is included, from creative lesson plans to an easy-to-use program guide. Opportunities for greater accessibility and blended learning are provided through images, primary sources, audio recordings, videos, and interactive-eBooks, Chromebook- and iPad-compatible. Professional resources help teachers strengthen instructional strategies used in the classroom. 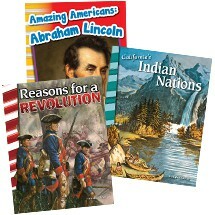 Engaging student texts, lesson plans, assessments, and primary sources deepen content knowledge and analytical skills. Students learn to listen, speak, read, and write while focusing on social studies content. Lessons encourage close reading. Students analyze complex texts and primary sources. Specific essential questions encourage critical thinking. 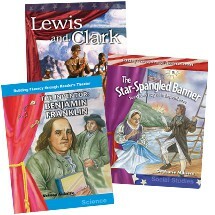 Key student texts and lessons deal specifically with citizenship and democratic values.